If you’ve watched nearly any NCAA sporting event on television in the past several years, you’ve seen the ad. You may even be able to recite the tagline: “There are 380,000 NCAA student-athletes, and just about all of them will be going pro in something other than sports.” It’s a noble campaign directed at educating the masses that most athletes in college will see their athletic careers come to an end at graduation. In the world of NCAA hockey, the vast majority of players on the 60 Division I and 90 Division II/III men’s teams will not make the jump to the NHL, AHL, ECHL or any other of the various professional hockey leagues around the world. But for a select few, college hockey is merely a steppingstone to the bright lights of the NHL. In fact, according to our research, a record 328 players who have seen at least one regular season NHL game in 2018-19 honed their skills in college before making the leap to the professional ranks. That number represents 33% of all NHL players from the current season. In 2018-19, 53 former collegiate hockey players have made their NHL debut. Through the end of the regular season, former college players stand as the seventh overall pointgetter (Gaudreau), sixth overall goal scorer (Atkinson), third overall assist scorer (Wheeler), second overall plus/minus performer (McDonagh), second-ranked rookie scorer (Keller) and seventh-ranked goalie by wins (Hellebuyck). Breaking down the list of 328 players by college sees Minnesota lead the way with 22 players, followed by Boston College, Michigan and North Dakota (21), Boston University (20), Wisconsin (15), and Denver and St. Cloud State (14). Nearly 33% of the NHLers who played college hockey spent all four years in school, with 69% staying at least three years on campus. 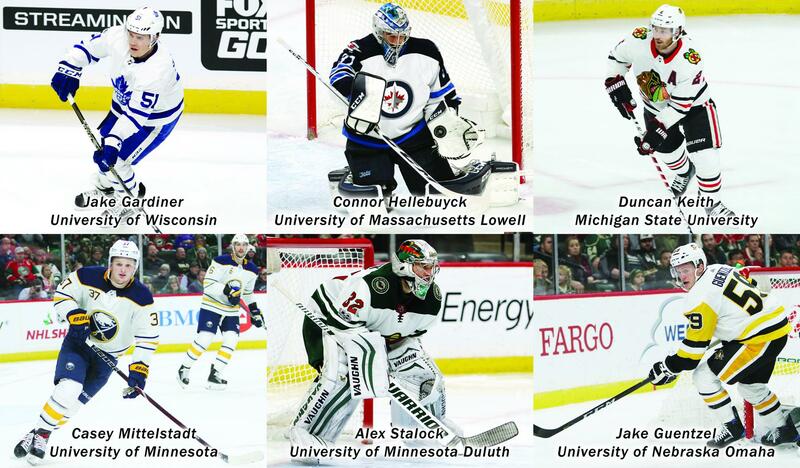 Nearly 30 percent of the former college players who played in the NHL this year were undrafted free agents. In the NHL, it sure seems some teams are more likely to sign, trade or draft for a college-bred player than others. In fact, 13 NHL teams had 12 or more college-bred players on the ice this season, led by the Anaheim Ducks, Minnesota Wild and New Jersey Devils with 18 college players each. 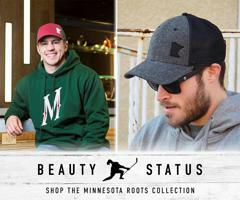 Naturally, the state of Minnesota is well-represented among the college-to-the-NHL players. Of the 328 players, there are 57 native Minnesotans, including 10 who made their NHL debut this season. A look at the NHL rosters of last 19 seasons also shows that college hockey players are gaining a stronger foothold in the league. According to our research, 210 players who saw at least one regular season NHL game in 1999-2000 played college hockey before making it to the big leagues. 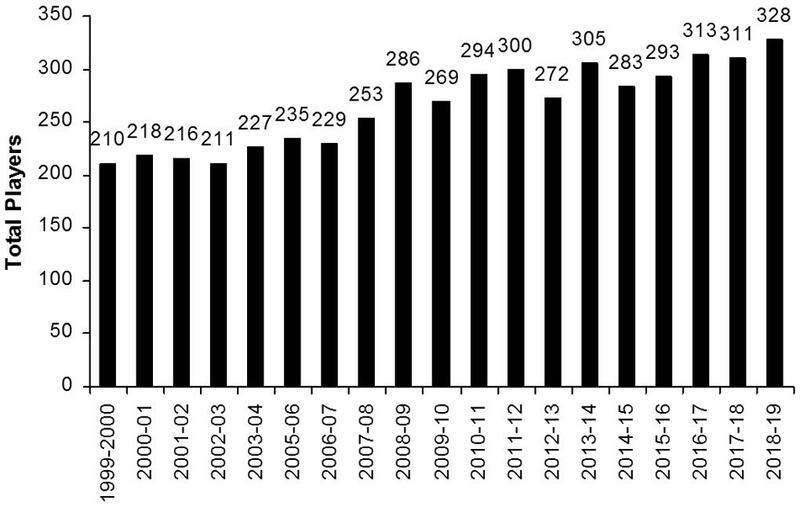 In following seasons, that number has continued to grow (see graph) to the this season’s high mark of 328, a 56-percent increase from 1999-2000. 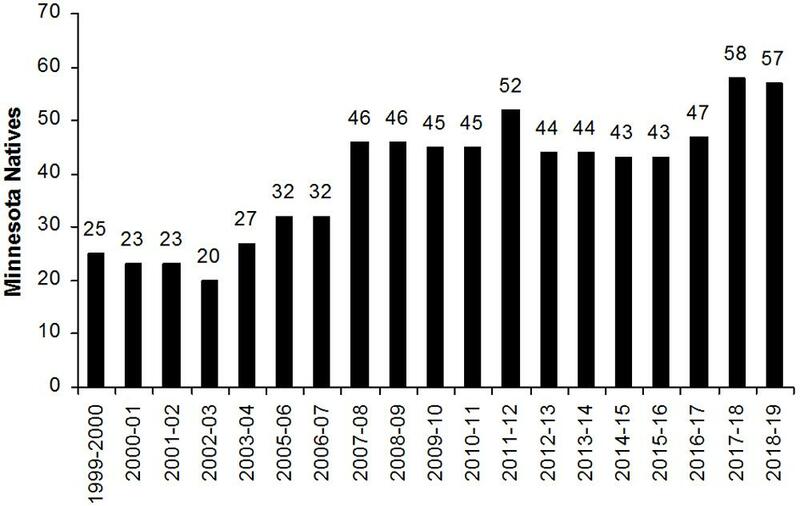 The number of colleges providing players to the NHL has similarly grown over the past 19 seasons, from 39 in 1999-2000 to a high of 49 the past three seasons. Along the same lines, the numbers of Minnesotan NHL players who also played college hockey has grown over the last 19 seasons. In 1999-2000, there were 25 college-to-the-NHL Minnesota natives. The last 12 seasons has seen 40 or more. And the numbers will only continue to grow as over 150 players have signed pro contracts since the conclusion of their 20118-19 college seasons. During the 2018-19 college hockey season, there were nearly 200 players whose rights were owned by an NHL franchise. In addition, the NHL Central Scouting Service’s rankings for the 2019 Entry Draft list 113 current or future college players. Phil Housley was the rare hockey player to make the quantum leap from high school to the NHL. Countless Canadians take the Major Junior route before making the jump to the pros. European players compete in the numerous leagues throughout the continent in hopes of someday earning a spot on an NHL team. But for 328 NHL players, college was the path to take. Thanks to College Hockey, Inc. for additional data.